“Charlie’s low-key but effective leadership over several decades really helped shape and preserve our natural products legacy, even though he stayed pretty much in the background as far as any great fanfare goes,” said Larry Walker, director of the school’s world-renowned National Center for Natural Products Research. Hufford “was a key player over many years in growing our culture for research,” said Barbara G. Wells, who, as the school’s dean, worked with him for a decade. Hufford has spent his entire career helping to make the School of Pharmacy succeed and “be a great place to work,” said Alice M. Clark, UM’s vice chancellor for research and sponsored programs. Hufford, who began his career here as an assistant professor of pharmacognosy in 1972, became his department’s chair in 1987 and his school’s first associate dean for research and graduate programs in 1995. He also thrice served his department as acting chair, first in 1977, only five years after joining its faculty, again in 1985, and yet again (1995-99) while associate dean. He is retiring Feb. 1. Hufford (left) and other pharmacy school leaders sign a column in the new addition to the National Center for Natural Products Research. 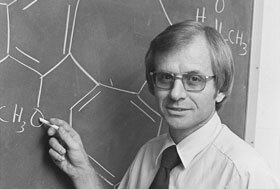 Hufford, who has worked under four pharmacy school deans, began garnering their respect and that of his colleagues in the early ’80s, when he and Clark, his wife, then an assistant professor of pharmacognosy; John K. Baker, then professor of medicinal chemistry; and James D. McChesney, then professor and chair of pharmacognosy, took the drug primaquine back into the laboratory to try to remove its side effects. Their efforts were based on the notion that one of the drug’s metabolites was causing its side effects, and another was killing Plasmodium vivax, the culprit behind relapsing malaria. With Clark feeding primaquine to select microbes and Hufford and Baker identifying structures of the metabolites they produced, the researchers found primaquine’s major metabolite, and it was one that hadn’t even been considered by other researchers. It was that work, she said, that led to the identification of carboxyprimaquine. Subsequently, the foursome published a paper detailing the mammalian metabolism of the isomers of primaquine. “Charles was highly accomplished in many areas of pharmaceutical research, but his efforts most brightly shined in the area of drug metabolism,” Baker said. But Hufford’s efforts didn’t stop there. By 1984, he and his colleagues were routinely determining whether plant and other extracts killed or inhibited the microorganisms that cause bacterial and fungal infections. To do so, they simply added them to flasks or petri dishes in which colonies of the pathogens were established, then watched to see what happened. Subsequent work by Hufford revealed the compound responsible for the extract’s antibiotic effects was liriodenine, which he patented. Because of their proven ability to find and characterize potent new antifungal antibiotics, Hufford and Clark received $500,000 from the National Institutes of Health’s National Institute of Allergy and Infectious Diseases, or NIAID, to screen compounds for activity against opportunistic infections threatening the lives of AIDS patients in 1984. With that grant, they found a group of potent antifungal antibiotics called sampangines. With that progress, the pharmacognosy duo received a $1 million contract renewal in 1987 and a $372,000 grant from NIAID in 1989. That grant was renewed four times and became one of the longest continually funded antifungal research programs in NIH history, brought $7.4 million to UM and led to the identification of many new natural products. Hufford also supervised work to determine the sampangines’ chemical structures with the aid of the school’s new high-field nuclear magnetic resonance spectrometer, then the only one of its kind in Southeastern pharmacy schools. Hufford helped acquire the NMR spectrometer and got it operating. He also became the “go-to guy” for interpreting the tremendous amount of data it yielded for compounds rising through the school’s drug-discovery program. Helping establish the school’s NMR capabilities was another feather in Hufford’s research cap. Today, the school has six NMRs, and it’s trading one of them in and buying three more. As a research scientist, seeing the school go from one NMR to eight is one of the most rewarding things to happen to Hufford during his Ole Miss career. The project would require more than $10 million, but it was launched in 2000, thanks to a $1 million grant from NIH. The grant application, which Hufford wrote, received a score of 120 on NIH’s scale of 100 to 500, with 100 being superior. With that initial funding, the school began constructing what would become a 10,000-square-foot structure at the rear of Faser Hall to house faculty and staff as their floors were being renovated. This “swing space” was used several times in ensuing years for that very purpose. At the same time, construction of NCNPR’s 96,000-square-foot addition (Phase II, or west wing) was “always on the drawing board,” Hufford said. Before construction could begin, however, the school had to accumulate the funds to pay for it. To obtain them, Hufford wrote five proposals and portions of a sixth. The first five secured $14.4 million from the Health Resources and Services Administration to plan and build the west wing and Centennial Auditorium that connects it to the Cochran Center and Faser Hall. One of the HRSA grants also provided both buildings with some essential instrumentation. The sixth, with Walker as the principle investigator, secured the $13.9 million from NIH that made completion of the west wing possible. As the school’s “externally funded program and building guru,” he helped lead the pharmacy school’s transformation from two buildings to “a complex,” said architect Robert E. Farr II of Cooke, Douglass, Farr and Lemons, which designed the Faser renovations, auditorium, west wing and Maynard F. Quimby Medicinal Plant Garden. “Charlie had to be ‘Mr. Building,’ ‘Mr. System,’ ‘Mr. Mechanical,’ ‘Mr. Electrical’ and ‘Mr. Laboratory Planner,’ as well as a psychologist, social worker, negotiator, counselor and scribe, who kept all the records of the steps and actions required to achieve the school’s transformational plan,” Farr said. Hufford is proud of the school’s transformation and his part in it, although it was “years in the making,” he said. Among the features he likes most about the complex is the walkway across the top of the auditorium that connects NCNPR’s east and west wings, facilitating collaborations among researchers. Hufford is as accomplished in the classroom as he is in the laboratory and administrative suite. As professor and chair of his department, for example, he revamped the pharmacognosy course for students in the school’s professional program by including information on dietary supplements and making it more contemporary and relevant to pharmacy practice. Hufford also developed and taught an elective about herbal products for professional students. “It is a very popular course,” said Marvin C. Wilson, associate dean emeritus for academic and student affairs. Ensuring that the quality of the school’s graduate programs was maintained and enhanced was “always a ‘front-burner item’ for Charlie,” Wilson said. The number of students enrolled in these programs grew remarkably on Hufford’s watch, as did extramural funding for the school’s research, training, service and construction projects. While associate dean, Hufford kept tabs on more than $314 million. Walker said Hufford’s “steady, patient and focused leadership, even in difficult situations,” enabled him to accomplish such things. 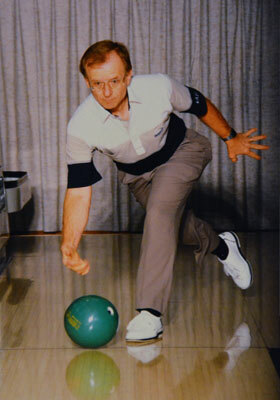 Hufford competes in a national bowling tournament in 1994. Yes, “Charlie can be a ‘bird dog’ about things,” Wilson said. “He is committed to everything he does, and his commitment to excellence is unwavering,” which explains why Hufford is an exceptionally competitive bowler. He bowled his first perfect 300 game at age 38. Since then, he has bowled 29 perfect 300 games, 21 800-series games and become a member of the Senior All-Star Bowling Association Hall of Fame and Mississippi State Bowling Association Hall of Fame. Hufford has even earned some money from bowling – not a lot, just enough to make him wonder if he could have made a living as a professional bowler. So, after retiring, he plans to go bowling full time. He’ll leave Thursdays for places such as Las Vegas, San Antonio and Austin and return Tuesdays. He will also make time to go to his grandsons’ baseball, basketball and soccer games. Clark said she hopes he will visit her “honey-do” list, too, and not buy any more bowling balls. Hufford’s son, Gary, received bachelor’s and master’s degrees in aeronautics and astronautics and is head of AVEVA Inc.’s Visualization Center of Excellence in Huntsville, Alabama. Gary and his wife, Lori, a managing partner of StrateSoft LLC, have two children: Ryan, 16, and Andy, 13. Hufford’s daughter, Jennifer, who received bachelor’s and master’s degrees from UM’s nationally ranked School of Accountancy, is a tax director with Deloitte Tax LLP in Nashville, Tennessee. 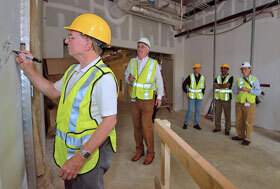 Before retiring, Hufford said he hopes to check a few more things off his bucket list: install the pharmacy school’s new NMRs, finish construction of the west wing and get Faser’s second floor redone. Even if he doesn’t get to all of them, he leaves a legacy that will continue through future accomplishments of the school’s faculty, staff and students. “One does not attain the laurel wreath of recognition through self-promotion but by working diligently for the common good,” said Baker, referring to Hufford.